"My work is rooted in the natural world." 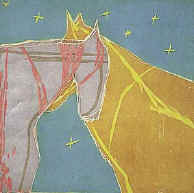 The horse is Susan Rowe's symbol of the natural world. In her oil- and wax-based painting, she represents her subject through the slow process of building layers of color and material. A definite form eventually emerges from the layers of each momentary impulse. Recently, through her work in woodcut printmaking and its separate stages of carving and printing, Rowe has come to distinguish between the abstract layers of color and texture and has defined the role each plays in her painting. Susan has had exhibits at the Contemporary Art Center Of Virginia.